Well, have ya'll missed me? The last few weeks, I've blogged every Monday and Tuesday for sure, only taking a couple of days off a week from blogging. Trust me, I would much rather have been blogging an entire book than enduring what I've gone through over the last four days. Lindsie came down with the stomach flu last Friday night, which led to guess what? ME coming down with it bright and early Monday morning. Not the greatest way to lose 6 pounds in one day, but if that's the silver lining, I can't complain. 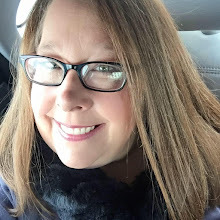 I'm feeling better now and ready to get my mojo going again! Luckily I had this project all wrapped up for the Verve Project Parade which started on Monday (so if ya'll haven't been over to the Verve Blog, you need to go check it out!) I have to just say that I think this has been my favorite Verve Project Parade theme to date--It's a Girl Thing, celebrating the women in your life. I had a couple of different ideas for Jen's theme this time, but after talking to her a little more about it, I knew what direction I wanted to take and that it would be a perfect opportunity to make a heartfelt gift for my mom (so Mom, if you are reading this--Happy Mother's Day a little early!). The sentiment from the Because of You set seemed to be the perfect choice for a special gift and could be used for just such a gift for any special woman in your life--a mom, grandma, sister, or best friend. The little wooden stand is an 8.5" Card Holder from Glue Art and Paper Studio that come unfinished and in several different sizes for endless possibilities. I found a little house-shaped chipboard album at Michaels for $1 (perfect for my mom since she works in a real estate office), but only needed the one piece from it for this project (Yay! I can make more!). 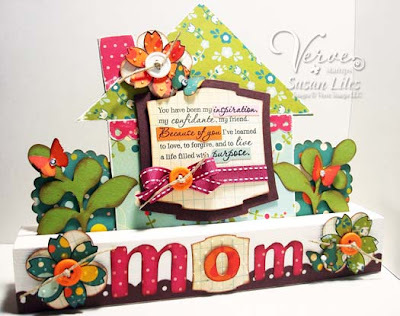 Several punches, Nestabilities and shapes cut from my Slice machine were used to enhance my project, but it wouldn't be as special without the Elegant Flower stamp from Verve that I cut out and layered on each side of "mom" and on the house itself. I had a lot of fun making this for you, Mom! Can't wait for you to see it in person (it's even better IRL!)! We also can't wait to see what you create if (when) you play along! To play along, just make a project or card that fits your style and celebrates a woman in your life. Then just add a link to your creation to the Mr. Linky form IN THIS POST before 8PM Mountain on Thursday, May 14. 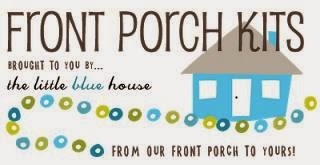 Two random participants will be chosen and win a $25 gift certificate to the Verve Store. Have fun with this and good luck! SUSIE Q-TIP: A throwback from my painting days: Always sand your wood project before even beginning to paint it. Here's the best trick: Sand it again after your first coat of paint has been applied for an even smoother finish to your second coat. WOW Susie this is Fantastic!!!!! Sorry you weren't feeling well! Feel better, girl! I miss ya! 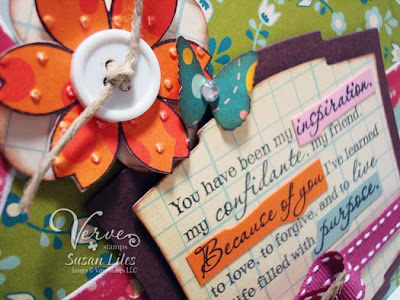 I just came from the Verve blog and had to come tell you how much I LOVE this project!!!! It ROCKS!!!!! Okay, I read the blog and saw the project (LUCKY ME -- I GET TO KEEP IT)!!! What a great job on this one and I'm so glad you already had it done before you got sick. In talking to you this a.m. I was so happy that you're feeling better; however, PLEASE don't overdo as that is the very worst thing to do cause you'll have a longer full recovery. THANK YOU my Susie! This project is fanTAStic, Susan! So many awesome details!!! This is so cool. TFS! Okay, SERIOUSLY jaw-dropping, Chickie! This is so fantabulous! Hope you're all better soon! Wow Susie-WOW-- This is a FABULOUS project!! I just love that paper and all the beautiful accents!! Hope you are all recovered soon! 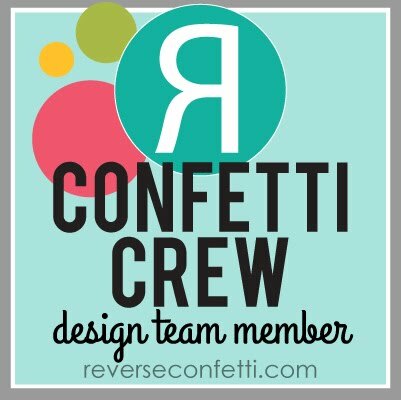 Wow - how fun is this project! I love the house and sumptuous garden! sorry you were down with the bug! This is so pretty! 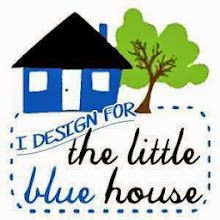 I adora the little house creation. I picked up several of those little albums at Michaels. Wonderful! What a really cute project and I so like the way you highlighted some of the words! Sus, this is amazing, and I mean amazing! Hope you're feeling all better--just keep looking at your amazing creation cause it's bound to make you feel all better! Glad you are feeling better - those bugs are nasty. This is the BOMB, Susie!!! I am in AWE!!!! Wow! Good grief girlie! This over the top FANTASTIC! I love all the bright colors -sheer perfection!